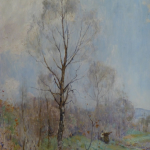 Attended evening classes at the GSA under Robert Greenlees before studying in Paris, he was closely associated with artistic life in Glasgow. 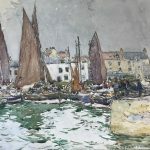 He painted Scottish fishing villages both East and West Coasts in oil and Watercolour. His watercolours being influenced by the “blottesque” technique of the Glasgow School. He also painted in Belgium and Holland where his oils were influenced by the work of Mesdag and Maris.